The Improv in Tempe, Arizona is part of a larger network of comedy clubs located throughout the United States that got its start in New York City in 1963. At that time the vision was for a place where Broadway performers could meet after their shows to eat, drink coffee and sing. A year later, a comedian decided to try out some new material on stage at the Improv and the beginnings of this legendary club, where every comedian wants to perform, truly began. The long list of stars that debuted at the Improv in New York is impressive. Expansion started in 1975 with the second Improv on Melrose in Hollywood. In the 1980s new locations were opened in San Diego, San Francisco, Brea, Irvine, Washington D.C., Dallas, Addison, Cleveland, Miami, Las Vegas, Reno and London, England as well as our own Tempe, Arizona club. In June 2012 Tempe Improv closed. It re-opened in April 2013 under new ownership. At Tempe Improv you'll see both local comedians and big-name, nationally known stars. All genres of comedy are covered here -- clean, not-so-clean, Latino, blue collar and more. Shows at Tempe Improv are either 18+ or 21+, depending on the show. One show on Thursdays, typically at 8 p.m.
Two shows on Fridays: typically at 7:30 p.m. and 10 p.m.
Two shows on Saturdays: typically at 7 p.m. and 10 p.m.
One show on Sundays, typically at 7 p.m.
2. By phone to 480-921-9877 (service charge). 3. At the box office, Tuesday through Saturday. Tempe Improv has a full food and beverage menu, with a variety of snacks/appetizers as well as several dinner entrees. Although I didn't try any of them, there are some appetizer/special combinations plates that looked enticing. There is a two drink minimum at this club. 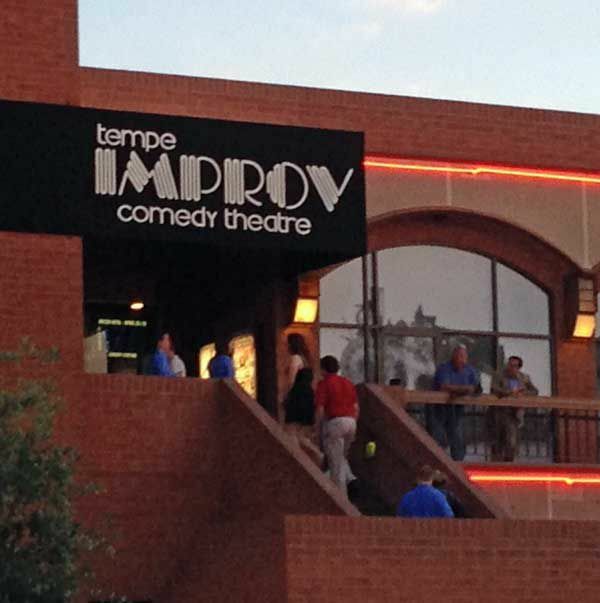 Tempe Improv is located in Tempe, Arizona near Arizona State University. It's in a commercial development on the northeast corner of Rural Road and University Drive. The closest highways are the Loop 202 Red Mountain Freeway (exit Scottsdale Road and drive south; it becomes Rural Road on the other side of the bridge) and the Loop 101 Price Freeway (exit at University and drive west on University to Rural). It is also accessible by METRO Light Rail and is just steps away from the Rural Road and University Drive station. .
All times, prices and offerings are subject to change without notice. Both nationally and internationally known comedy stars, as well as local aspiring comics, appear at Tempe Improv. Before you buy your tickets to a show at the Tempe Improv comedy club in Phoenix, here are ten things you might want to know. Parking is free at Tempe Improv. For the early show, doors open at least an hour before show time so that you can enjoy appetizers or dinner before the show. For popular performers, seats in the front of the room fill up quickly. The seating is arranged giving just enough space for people to move their chairs around to face the stage, but it isn't easy to get up without your chair banging into the back of the chairs at the adjacent table. I really liked the counter seating, but up in the balcony I'm not sure that the acoustics are that great. Generally, the smallest tables here are for four people. If you are a couple, you might have another couple seated with you. The menu has a nice variety of choices, but this isn't gourmet dining. If you want fine food I recommend eating elsewhere either before or after the show. That might also eliminate any service challenges of getting your food before the show starts, when it is extremely busy. I ordered two different specialty mixed drinks ($11 per drink, 2013) at Tempe Improv. In the future I would stick to beer or wine. In addition to your ticket price there is a two drink minimum. Non-alcoholic drinks count toward the minimum. If you aren't certain about the type of comedy of any particular performer scheduled, you can see sample videos at the Tempe Improv website. Notwithstanding the name of the place, most of the shows here are stand-up comedy, not improv in the true sense of the term. Open mic nights are cheap tickets (still a two-drink minimum) and are open to people ages 18+. Participants need to register in advance. They each get 5 minutes to make you laugh.